Today's Spectator reports that the City will proceed with a pilot project to close part of the south leg of King Street East at Gore Park this summer. The pilot project, which would run in either June or July through to August, is a test run for the proposed promenade in the city's Gore Master Plan, which includes the concept of raising the roadway between the park and the storefront sidewalk along the south edge of King. "What we're trying to do is simulate a pedestrian space that blends with the park ... We're providing a seamless connection between the park and the businesses between James and Hughson," the city's acting manager of landscape architectural services Steve Barnhart said. This is welcome news after the pilot project was cut out of last year's budget and metered curbside parking was installed on the south side of Gore Park instead. Norton said plans to turn the south leg of Gore Park, between James and Catharine streets and adjacent to the hotel, into a pedestrian walkway won't happen before the Games. "I don't see it starting before Pan Am because you don't want your downtown street torn up during the largest visitor event in our history," said Norton. This money would allow meters to be bagged, the south leg temporarily closed, and things like street furniture to be installed, for events similar (but bigger and more of them) to what is happening now on Wed through Friday under the auspices of the Downtown BIA. Last summer, the Downtown BIA held a Gore Park Promenade three days a week, with a series of small commercial and cultural vendors set up around Gore Park. This summer's pilot project to close the south leg of King between Hughson and James will allow the BIA to expand its Promenade the second time around. I think this is a good idea so long as merchants are willing to capitalize with outdoor patios or a market of some sort. Besides the buses (which have been removed) who really drives down that leg of Gore anyway? I drive down there to stop at the bank. Since you can't turn left into there when going north on James, or drive south on Hughson, it's impossible to get in there by car. Since there isn't another Scotiabank between my home and Westdale, unless you go into Jackson to hit the ATM there or go down to the waterfront, it makes it very inconvenient to get in there. Since you can't turn left into there when going north on James, or drive south on Hughson, it's impossible to get in there by car. And you've just hit on an important reason why we need proper two-way conversion of our downtown streets. Even drivers benefit from a street system optimized for flexibility and accessibility, rather than fast flow-through of aggregated traffic. Hughson is only wide enough to go one-way, unless you tear out the wide sidewalks. The roadway going through Gore (between the south side of the park and the stores) is also not wide enough to fit two-way traffic, unless again, you do away with the parking or do not put anything out on the street. Along that stretch, since the alleyways are extremely narrow and unsafe, there needs to be a place for people, including trucks and delivery vehicles, to stop, run into the shops or drop off packages, and then leave. Seriously? Now four lanes is too narrow to have two-way traffic and curbside parking? are we talking about the same roadway? At best it's 2.5 lanes wide; with parking it's about 1, maybe 1.5 lanes wide. Seriously, your anti-car bend is getting tired. My apologies - reading comprehension fail. I thought you meant the main trunk of King Street, which is four lanes wide and an excellent candidate for two-way traffic. The south leg should be a pedestrian plaza as the Gore plan recommends. As for Hughson, it's wide enough for one lane in each direction - and there's no curbside parking now, so it wouldn't be missed in a two-way conversion. It's not a thoroughfare and any automobile traffic on it should be slow. If a delivery truck is parked on the side, cars will have to slow down and go around it, just like they would on any side street. I'm not anti-car, I'm pro-balance. I believe our road network should balance the needs of pedestrians, cyclists, transit users and drivers. Right now it overwhelmingly caters to drivers - and downtown, it caters even more narrowly to drivers passing through the downtown. I'm glad that this process is moving forward, but it does occur to me that the trial closure from Hughson to James will cover three banks, two restaurants, one convenience store, a payday loan outlet and a dirt lot. I'm interested to see what will come of it, but I expect limited magic. 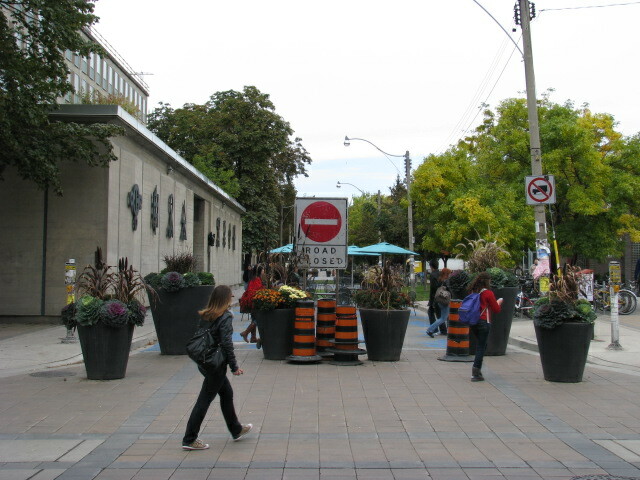 I'd actually be okay with making such an arrangement permanent - develop a way to install/remove barriers and intersection-modifications that allows the City to close the parking area without having to pay officers to guard the closed entrances/exits to the pedestrian area from cars. Some kind of traffic-light modifications and some permanent gates or something. This way, the area could be used as a pedestrian area during the summer and used for parking in the winter. Wilcocks Street - UofT property, just off St. George St.
How about setting up some food carts like coffee, fried treats or ice cream for people to linger? I hope they choose decent street furniture. I'm still glad to see it happen though - at the minimum we'll see that the removal of those parking spaces will not cause mayhem for anyone except the employees who park there all day. This needs to be reiterated. The city keeps trying to push parking downtown as a commerce thing, which flies in the face of the facts - all the lots downtown are aimed at commuters who work there, not their customers. Instead of making it better, the free-meters-on-weekends problem makes it worse since the meters are the only cheap short-term parking downtown, and on weekends they're rapidly consumed by all-day usage. Who are you even talking to, and what specific ideas make this city an unpleasant place to live? Here's a picture of your paradise: More lanes, higher speed limits, fewer buildings, more empty parking lots, fewer residents, higher taxes, terrible air quality, zero civic pride. I'd ask you offer some ideas or solutions to improving the city from your standpoint please. It's important to offer a positive counterpoint when taking issue with an idea. Lest you lose the content of what you are for, you will merely be defined by what you are against.